Is God calling you to GO and serve? Shepherd’s Grove Presbyterian Church is commissioning a team to build a playground at the Christ Church Christian Care Centre (5Cees) orphanage in Johannesburg, South Africa. The 5Cees orphanage provides love and care for over 100 children and has been a ministry partner for 15 years. This amazing adventure will be an incredible blessing to the 5Cees children and will be an awesome faith journey for the mission team. What will the team do? We’re partnering with Kids Around the World to build a playground at the orphanage. The team will also engage in other service projects and have an opportunity to engage with and learn more about the people and culture of Africa. Trip dates: Depart 7/5/19 and arrive home on 7/16/19. Cost per person: $2,500 (includes airfare, lodging, food and other incidental trip costs). A non-refundable $500 deposit per person will be required by March 28, 2019. Why is IPC engaged in Africa? Over 300 million people in Africa live on less than $1 per day. Over 30 million people in Africa are HIV positive. This represents 70% of global infections. Over 11 million African children have lost one or both parents to HIV/AIDS. God calls us to be the hands and feet of Christ — to respond with compassion to His children who are suffering in the world. We can look at God’s people in Africa with stolen dreams, at an entire continent whose future hangs in the balance, and question God. Or we can look at these problems and realize this is God’s question to us: Who cares about the people of Africa? We do! For more information about Africa missions, contact David Boyd at 949.433.9737. Give the Gift of Hope to a Child in Need – 100% of all sponsor donations will provide critical life-giving support to the children served by our Africa mission partners. Over 40% of all adults in Swaziland are infected with HIV. As a result, thousands of children have lost one or both parents, and are either living on the streets or with very little support. The New Life School is a beacon of hope for many of these children. This Christian high school provides an education, food, and shelter for orphaned and poverty-stricken children. Pastor Solomon Fasanmade is the Director (and founder) of the school. IPC has developed a child sponsorship program that currently provides hope to children in need. IPC also commissions short-term missions teams to serve with the children and staff at New Life. Rev. 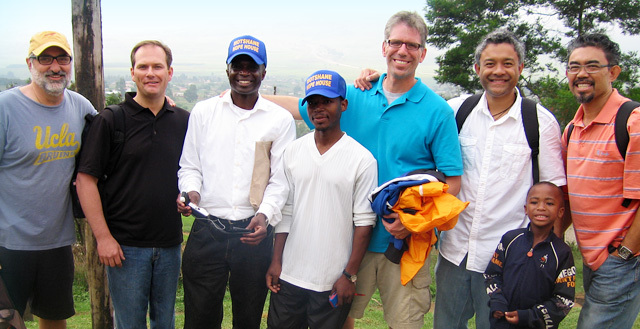 Paul Siaki is a tireless missionary who plants and nurtures new churches in Africa. He also trains pastors to serve and lead these churches to further God’s kingdom. The hearts and lives of people in Africa can only be transformed through God’s love and grace. Paul’s work in Africa is spreading the Gospel to a continent that is yearning for God’s healing transformation. IPC provides ongoing prayer and financial support to Paul Siaki and OC International. After decades of oppression, Soweto township is burdened with 60% unemployment, a high crime rate, and poverty. UBCD is playing a central and mission critical role in transforming the lives of God’s people in Soweto. UBCD ministers to the needs of the community, and also has a food program. UBCD serves the poorest of the poor: those living with poverty, unemployment, HIV, and lack of educational opportunities. In June 2014, Themba and Buhle established a new community development center in Natal, South Africa. The Natal center provides food, tutoring, spiritual mentoring and counseling, home-based care, and after school activities to a rural, impoverished community. Rev. Mike Sunker is the Director of the 5Cs, and heads a staff of 14. IPC provides ongoing prayer support, and routinely commissions short-term mission teams to serve with this ministry. Education and spiritual counseling for young children and troubled teens.